The Rebellion may prefer not to deal with criminals, but the Rebels still need the services of dedicated smugglers. 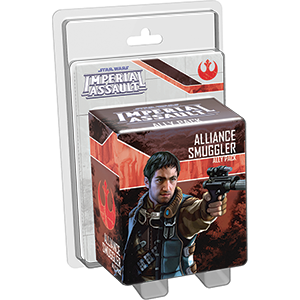 You gain a single Alliance Smuggler in the Alliance Smugger Ally Pack for Imperial Assault, alongside new missions and cards to enhance both campaigns and skirmishes. You can smuggle supplies past your opponents in a skirmish game to claim additional victory points or race to recover the cargo of a tramp freighter in a new campaign side mission. With the ability to slip past your opponents and hold his own in a fight, the Alliance Smuggler is a worthy addition to any strike team.